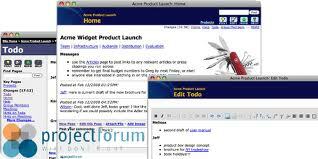 ProjectForum is a professional wiki collaboration server platform for small-medium teams. where team members can easily coordinate there projects and teams over the web or Intranet. it provide easy to use and professional web workspace where your team can collect, manage and discuss all your work online, privately and securely. You can use ProjectForum for project planning, todo lists, design notes, task assignments, meeting notes, problem reports, team discussions, collecting feedback, research, brainstorming and more. You can run ProjectForum on your own computer (Windows, Mac or Unix), or host your team's work on Projectforum's server, so everyone on your team can join the discussions and share their ideas and write-ups immediately.